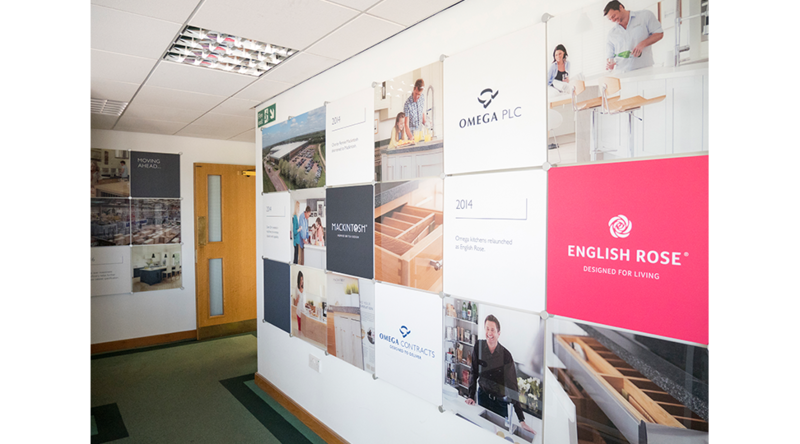 Omega PLC are a leading designer, manufacturer and marketer of high quality fitted kitchens and furniture. We were asked to print and install graphics at their 315,000 sq. ft. complex, based at Thorne near Doncaster. 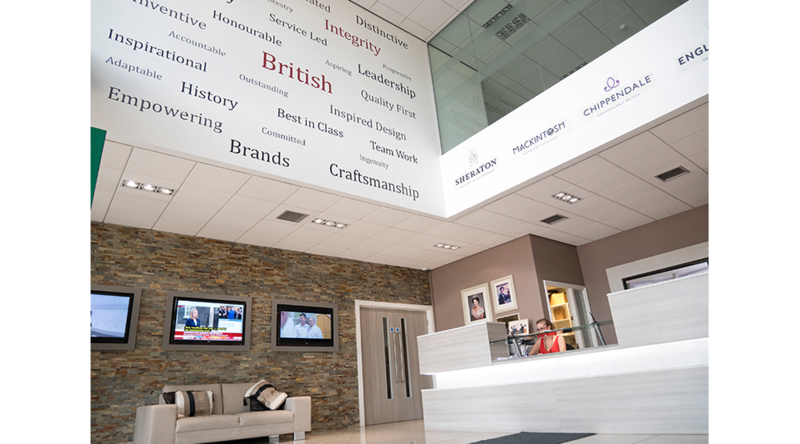 The brief was to create three feature walls consisting of individually printed words that showcased the company’s values and helped to enhance the building’s entrance space. We were also asked to create a timeline feature wall to span the main staircase and leading corridor walls. 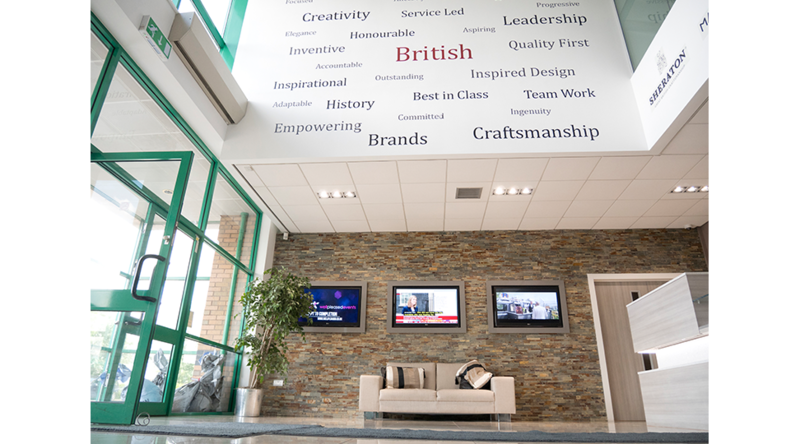 Each word would need to be individually applied to three key walls in the main ground floor reception and first floor foyer. Specialist access equipment was required for the high level reception wall, where we were then able to apply each word with a careful attention to detail. 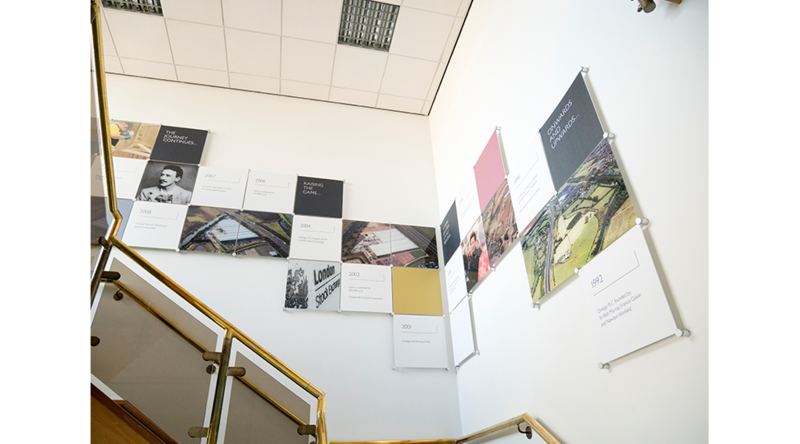 The timeline consisted of modular square graphics printed on PVC and acrylic, all individually wall mounted on interconnecting barrel mount locators. These were designed so that the timeline can be easily updated and extended in the future. 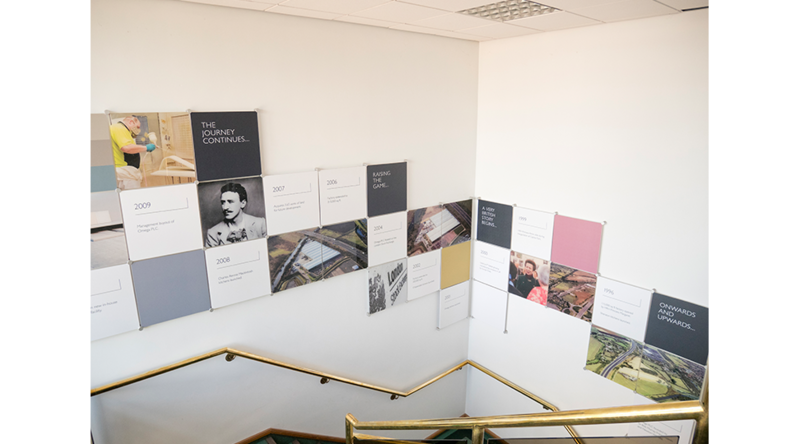 The graphic display begins on the ground floor with the inauguration of the company back in 1992 and continues up the staircase walls onto the first floor corridors. The result is a well-branded, smart entrance space that showcases OMEGA’s achievements and creates a fantastic first impression for all those who visit. The pre-ordering support from David Brisk at Digital Plus was excellent. Helpful quick replies to my queries, and endless patience as the specification for the project was developed and amended. On installation day the team arrived promptly and worked efficiently as well as flexibly enough to make modifications when the need arose due to other elements of the build. Very happy with the signage supplied & fitted by Digital Plus, great company, quality product, competitively priced and quick turnaround. Recommend! The Team at Digital plus are beyond excellent. We have used them for many years and they will always be our preferred supplier due to the quality of service they provide. They are immensely accommodating and always go above and beyond to ensure our clients get the 1st class service they deserve. I couldn't recommend them highly enough! Thank you so much for turning the banners around so quickly and for getting them to us in plenty of time for our event. We’re so pleased with them. Thanks for all your support! Digital Plus did a brilliant job with our promotional boards. It’s clear the team is very skilled and it showed in the first rate job they completed. We really appreciated the level of finishing that went into them. We received from Digital Plus a quick, comprehensive and competitive quote. Communications were excellent, the installation was fast and professional, and the product quality is A1. We chose Digital Plus because they had the necessary equipment to fulfil the project and they’ve been very professional, maintaining a structured approach and the highest quality throughout. The team are friendly, professional and determined to help. They take on board any project and go the extra mile to help you find a solution. You can always rely on Digital Plus to provide excellent customer service and good turnaround times. We rely on Digital Plus for their competitive prices and short lead-times. They always deliver a high quality product even when meeting my crazy expectations and requirements! Digital Plus offer unbelievable flexibility. They have a huge variety of products and services so you are never simply sold an off the shelf product. The team are creative and proactive whilst remaining well priced and efficient. Digital Plus listen to your ideas and make them happen – even better than you first imagined. Their attention to detail and a willingness to go the extra mile is second to none. 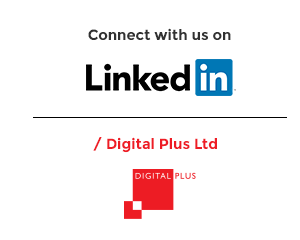 We rely on Digital Plus because of the quality of their products and the dedicated service they offer. We were really pleased with the finished job and how helpful and polite the fitters were. The signage and images designed and installed at our new call centre by Digital Plus have made a huge impact and created a vibrant and exciting environment for our staff. They made the whole process very easy for us and then installed it without fuss. I’ve been delighted with Digital Plus. The service they provide is professional and of a really high standard. They give me confidence that they’ll pull out all the stops to make sure things happen. The team are a joy to work with and I would certainly recommend them to others. We always trust Digital Plus to meet our demands without compromising on price or quality. It’s always easy working with them, they’re so enthusiastic and passionate about what they do. Just wanted to say a big thank you to Digital Plus. They listened to our requirements and proposed the best solution for our exhibition stand. The support and the communication was great. We were extremely pleased with the end result and will certainly be using your services again. Their imagination and creativity was second-to-none when it came to coming up with ideas for our exhibition stand. Coupled with the help and support they gave throughout the project was first class. 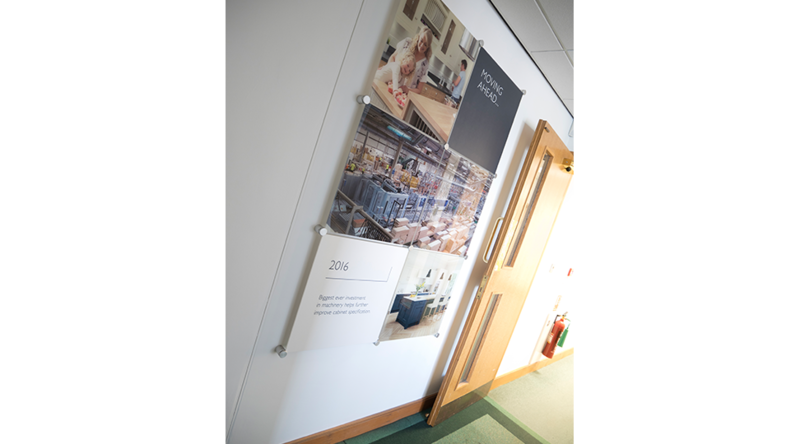 We have built an excellent working relationship which has grown from the initial project to Digital Plus being the main supplier of bespoke signage and artwork for Carlsberg secondary logistics in the UK and in turn are now supplying other parts of the business. I just wanted to say what a fantastic job you did supporting our launch day. It has been a pleasure working with Digital Plus. Your support and service has been over and above our expectations. Thank you for the speed and quality. Everything that was asked has been achieved to a high standard. Digital Plus are a new supplier for us. They won the business based on a keen price combined with great print quality. Their responsiveness and speed of delivery were excellent too.